Every month we spend an evening scouring the pages of the latest issue of Previews and pick the ten titles we are looking forward to the most. This month it's the August issue which includes comics scheduled to ship in October 2015. Rob N: If you're a highly respected writer with a devoted following then you have the luxury of launching a new ongoing series without going into much detail of what it's about. 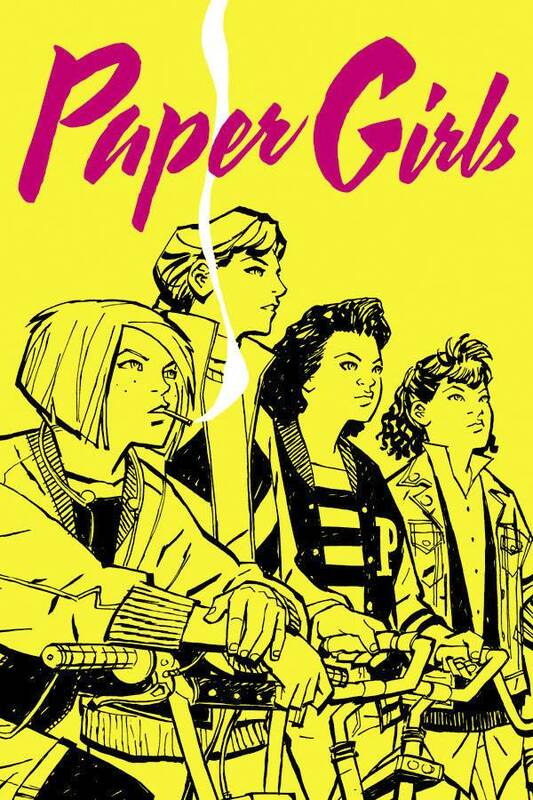 You can simply say, for example, “This is my new comic book and it's about a group of paper girls having adventures!” and leave it at that because your devoted following will then say, “Wow, it's a new Brian K. Vaughan series, so it's obviously going to be good. We must buy it!” It helps then if your name does happen to be Brian K. Vaughan, which in the case of Paper Girls, it is. 'Paper Girls', if you're not familiar with the term, is a somewhat outdated concept in the modern world (now that we all get our news from the internet) which may still exist in quiet rural villages in Dorset where small children on bicycles deliver newspapers for three shillings and sixpence an hour and a handful of Werther's Original Toffees as a tip at Christmas. If they have adventures it usually involves thwarting dastardly foreigners who are almost certainly Communists or Germans or working class, or all three. They wear shorts or pleated skirts and say “Golly Gosh!” a lot. This may not, however, be an accurate prediction for the tone of a new Brian K. Vaughan series called Paper Girls. James R: I have to admit that there are not an awful lot in Marvel's relaunch titles that have captured my imagination, but this (along with Doctor Strange) is the exception to the rule. Jeff Lemire knows how to write a team book (Justice League Dark) and he is the absolute master of understanding the alienation of youth. Lemire writing an X-Men book seems like a great fit, and with art from Humberto Ramos and Edgar Delgado, it looks terrific. I've been longing for an X-book to pick up since the end of Jason Aaron's magnificent Wolverine & The X-Men, and even though plot details are being kept under wraps, this looks to fit the bill perfectly. Matt C: I know Gilbert Hernandez is an alt. comics legend (via Love & Rockets and more) but for whatever reason I’ve never investigated his stuff – there’s never been that impetus for me to give it a try. Until now, that is. The ‘why’ is pretty obvious: just take a look at who’s illustrating this book. 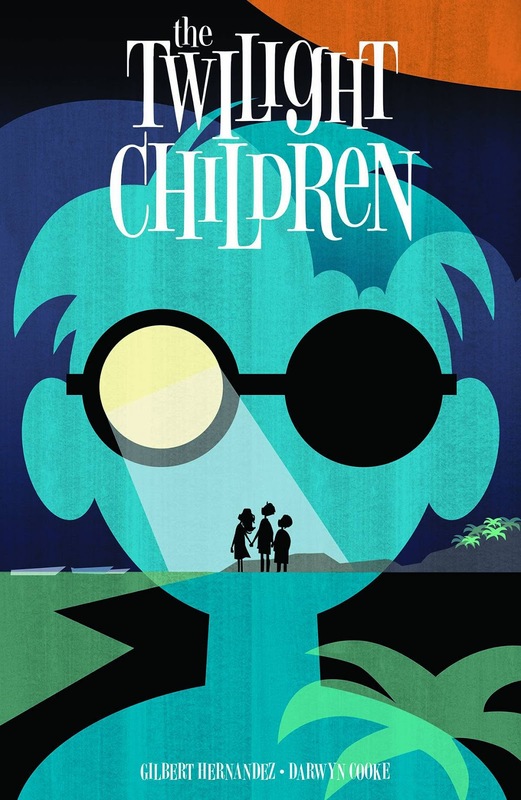 Basically, whatever Darwyn Cooke turns his artistic talents to, I’m there. The solicitation speaks of magical orbs, blinded children, aliens, the CIA… ingredients that, combined, don’t scream of originality, but Cooke in the artist’s chair means it’ll look beautiful, whatever it’s about. Hopefully the script will be a good fit for his talents (I’m guessing it will) and either way, it’s good to see the Vertigo imprint moving forward again after a period of stagnation. Stewart R: And so here it comes, the big crunch time, will I be continuing with Dan Slott's iteration of Peter Parker in this new, post-Secret Wars world? I've been picking up Amazing Spider-Man in its various volumes since Civil War nearly ten years ago. I've sat and read through the relaunches and history revisions that have accompanied the title through various creative tenures until Slott made the book his and his alone and I've stuck with him as he's tried to turn Peter's life around and show that he can be both a success in his everyday endeavours and still be Spider-Man. I'll admit I've felt the writing dip when we've been waiting for the next big Spider-Man or cross title event to roll around and all I've wanted on this book for a little while has been some sense of solid continuity to an idea; the last time it felt we had that was when we had 'Superior' in the title. So now we're going to get a jet-setting entrepreneur Parker who trots the globe with a new Spider-Man costume in his bag - that sounds like Peter finally making it, but the globe-trotting aspect of it all is going to be the make-or-break premise that possibly sees me step away from the webbed-wonder, or carry on with Slott's developing vision. Rob N: This is actually a very good month of new releases for me, bearing in mind that some months I can barely scrape together a single title that arouses my jaded and debauched interest, so much so that I could easily have written about seven different books this time around, but that wouldn't have left much for anyone else now, would it? Whittling that list down to three titles wasn't easy, but what was easy was the decision to pick a new Greg Rucka title as my first choice. 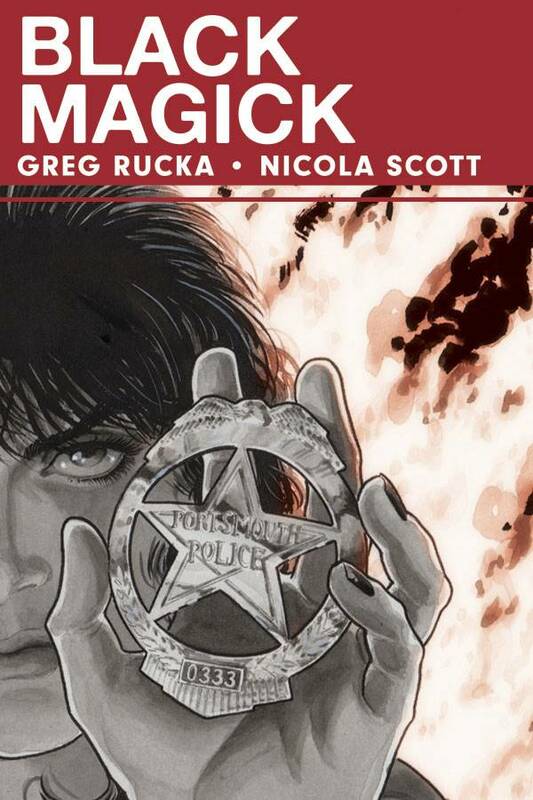 It's about magick and imposing your will on reality and things that go bump in the night, and I should point out that the almost monochrome artwork looks great, but frankly all you need to know is it's by the author of Lazarus, which remains my number one comic book at the moment, with no sign of letting up. One day Greg Rucka will disappoint me, but that day hasn't come yet, and I suspect that day is still so far away on the horizon that it's holding hands and skipping towards the sunset with 'the day I'll be disappointed by an Alan Moore book'. 'Nuff said. Stewart R: At the point this comes out we'll be nearing the year anniversary before Benedict Cumberbatch's depiction of Stephen Strange appears on the big screen and as such we can expect a big push from Marvel to reintroduce readers to the Sorcerer Supreme and potentially bring in new readers off the wave of publicity. The creative team they've assembled to conjure this new series shows that the publisher is taking this as a serious proposition; you don't tend to put the likes of the writer of Thor, Star Wars, Weirdworld and Southern Bastards together with one of Marvel's most prized artists, responsible for visually stunning runs on Uncanny X-Men and Wolverine & The X-Men in recent years, on just a whim. 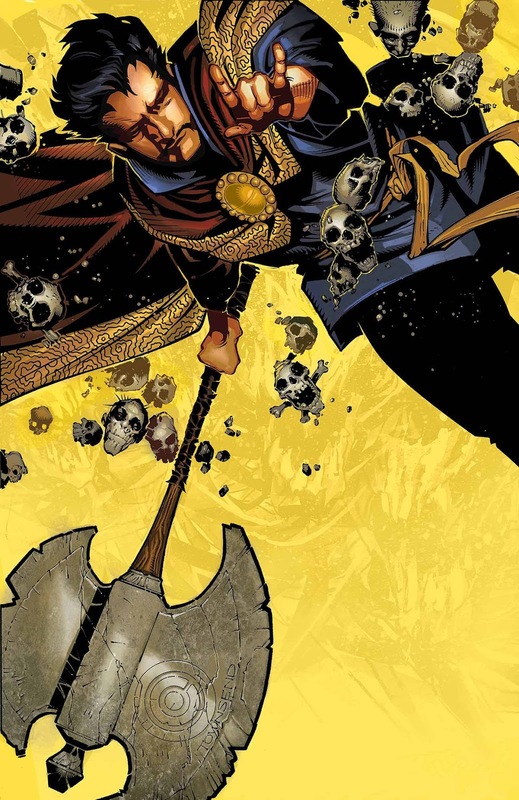 Aaron certainly has the writing chops to cut to the heart of a Doctor Strange book, not only pitting him against supernatural forces which only he is capable of fighting, but showing the cost to the man's soul and mind that such a conflict would take. Bachalo's rather unique visual flair and natural talent when it comes to layout and composition should make a perfect fit for a book where we can perhaps expect everything to no be as it seems. This is certainly one title that nearly all of the PCG are looking forward to from the announced post-Secret Wars books. Rob N: The monthly meeting of the PGC ‘Ten Forward’ Illuminati Committee did indeed break into a brief but excitable and rousing rendition of the Kate Bush single when we turned the page in the Previews catalogue to this new title. But if you're expecting a Chris Achilleos inspired swordswoman resembling La Femme Bush, you may be disappointed, for in this case comic book author and 2005 Mercury Music Prize winner, Antony and the Johnstons, has obviously drawn heavily from the Modesty Blaise canon of work with the tale of a legendary foreign crime lord, now retired, who is coerced to work for government agencies in the country she is sheltering in, or face the worrying threat of being deported back to her home country where far more evil crime lords than her, that she crossed years many ago, would be only too happy to 'welcome' her back. Ed Brubaker's excellent old school spy series Velvet shows there's a market for this kind of story, so let's hope Codename Baboushka bears fruit from the same tree. James R: It seems reports of Vertigo's demise have been exaggerated! It was really refreshing to see a host of new titles from DC's mature imprint this month, and this is the one that piqued my interest the most. It's the first Vertigo book for the excellent Gail Simone and it focuses on Astrid Mueller, the head of a powerful self-help organisation *cough* Scientology analogue *cough* whose book has caused one reader to end his life. 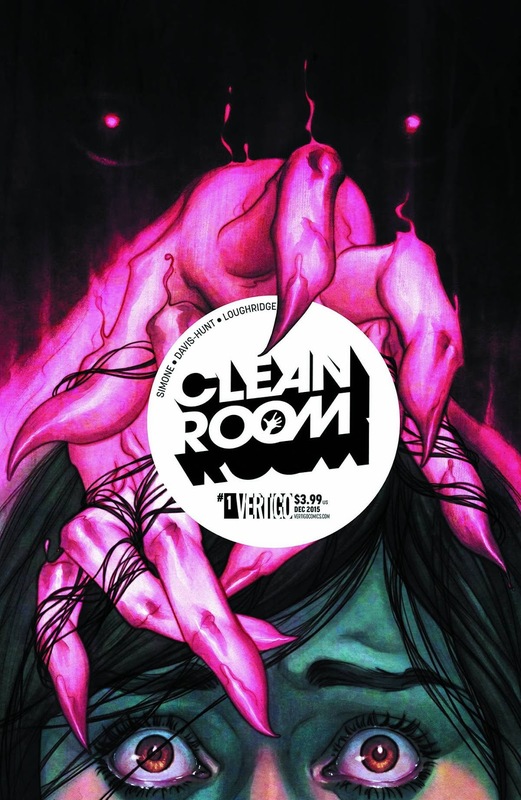 Who is the enigmatic Mueller, and what is the secret of the 'Clean Room' , where, Room 101-stylee, you face your greatest fear? With art from 2000 AD alumnus Jon Davis-Hunt, this looks to be extolling the classic Vertigo attributes of creepiness and intelligence, and it will be a welcome addition to my pull-list. Matt C: I’m a dyed-in-the-wool Star Wars fan but until this year I hadn’t regularly picked up a Star Wars comic book since, well, back in the early ‘80s and the UK reprints of Marvel’s Star Wars series. And that was a long time ago. So I think it’s a testament to the quality of the relaunched franchise this year – now back at Marvel, natch – that many of the new books are fixtures on my pull-list. Not all of them have hit the mark but the good has outweighed the not-so-good. Will Chewbacca make the grade? Well, he’s been a firm favourite since I was a kid (I always wanted a Wookie pal of my own! ), there are two solid creators involved, and who wouldn’t want to read a book where the main character delivers such pearls of wisdom as “Rowarrrrrrgghhh!” and “Rarrrragghhh!”? It’s a no-brainer really.